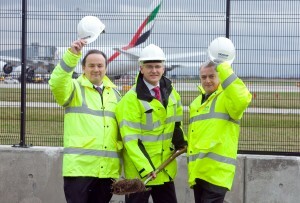 The first section of ground has been broken in preparation for Manchester Airport’s new Air Traffic Control (ATC) tower. To capture the construction from start to finish a time lapse camera has been installed to show every moment that goes on during the build, which will be made available for the public to view. NATS Manchester General Manager Paul Jones (left) with Manchester Airport Managing Director Andrew Harrison (centre) and Area Director for construction company Morgan Sindall, James Morgan at the turf cutting ceremony. Work has now started at the site and the 60 metre high tower is expected to be completed by Spring 2013. Construction, design and infrastructure company Morgan Sindall, the contractor for the £16m project, was present at the sod cutting ceremony. NATS, the UK’s leading air traffic control company, and Manchester Airport have teamed up and launched a time-lapse camera that is located on the roof of the current tower over looking the new tower site. It will take a picture every 15 minutes over the course of the project and there will be a weekly one-minute video produced of the works to date that will also be broadcast on the airport’s Youtube channel. Paul Jones, NATS’ General Manager at Manchester, said: “We are delighted to be working in partnership with Manchester Airport Group on the fitting out of their new tower. The control tower, located adjacent to the north fire station, will house a new visual control room, alongside an approach radar section and navigation, surveillance and communication equipment to ensure ATC can effectively service the long-term investment and future growth of the airport. The new tower will be a standalone, purpose built building, with the base of the building housing a new equipment centre and offices for the Air Traffic Control company, NATS. With 360-degree panoramic views, it will provide unrivalled views of the entire airfield operation. At present, cameras are used by controllers to assist with the view to the furthest runway end. NATS will manage the equipment and run the tower’s 24-hour operation while Manchester Airport will own and maintain the building. The current air traffic control centre, located on top of the tower block, is 40 years old and is being reviewed as part of the renovating process.